Today, September 1st, is the first day of Autumn. 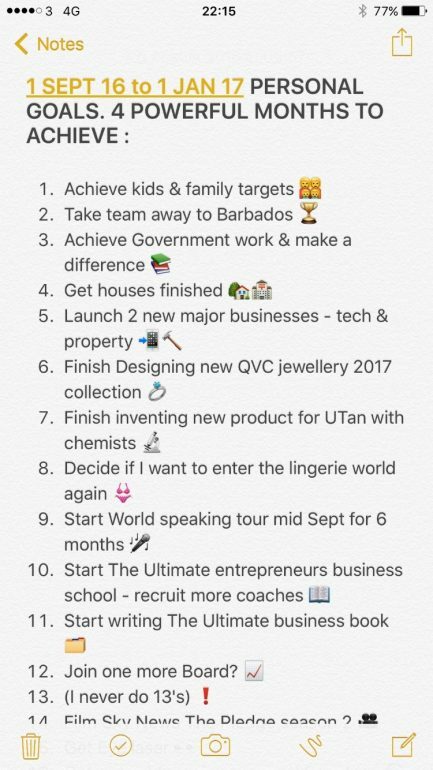 I spotted a tweet by Michelle Mone, you can find her here @MichelleMone The tweet was about her Personal Goals for the next 4 months. She has a very open approach to sharing on social media; what she’s doing, thinking and aiming for. It’s all highly personalised to suit being the best version of herself to achieve what she wants for herself and others. Scroll to the bottom for the actual tweet link. 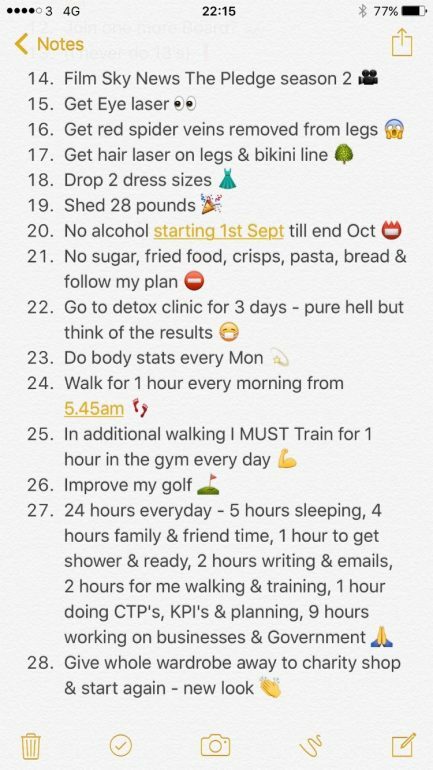 These are her Personal Goals from Sept 1st 2016 until Jan 1st 2017. Some are general, some are highly specific. Some are outcome goals, others are performance or process goals – in case you’re familiar with the ideas of different goal types. I like the richness and variety she’s gone for. They’re a mix of being fun and serious, for herself and others. Some will be stretching, others more easily achieved I presume. There’s bound to be some inspiration in there for most people so I thought I’d share them because they’ll come in handy with coaching clients. I often share my own Personal Goals but it’s FAR more interesting sharing others too. Are you getting some fresh ideas? Feeling more or less committed to your own goals? Deciding you need more or less goals yourself? Wanting to change or keep yours? I’d love to hear more examples. Share on this blog, or my social media if you’d like to and we’ll get some conversation going. I feel a little silly for not realising that these 4 months could be “4 powerful months” usually at this point I start to panic about Christmas and moan about the nights drawing in! This made me refocus on what can be achieved in the next 4 months and how I might get there. I divided my own list up into health and fitness goals, work goals, home and family and a list of dull stuff I have been putting off since the new year. I loved the little emoji imaged and I will add a pleasing ✅ when completed. Thanks for sharing!